I have felt compelled to paint nearly every day for more than 35 years.Â My studio and gardens are a source of constant inspiration: full of light, color, pattern and texture. Still life subject matter is the major vehicle for expression.Â I spend a great deal of time composing a still life and then work directly from the subject.Â My passion is making rich and complex oil paintings through color, light, line and texture.Â I strive for paintings where these elements are just as important as the subject matter.Â It is important to me that the surface of the painting is layered and varied.Â I use thin washes, opaque layers, transparent glazes, and pastel and charcoal mark making on 300 lb water color paper or canvas to achieve this. My painting is the result of the combination of steady work, motivation to create and inspiration.Â Experience has taught me how to get to that place where the magic of a really good painting happens. Carol Stewart was born in Ontario, Canada in 1959.Â She obtained a B.F.A. from Queen’s University in Kingston, Ontario in 1981, and finished her M.F.A. in painting at Fontbonne University in St. Louis, Missouri in 2010. For more than 35 years, Carol has rendered still life and gardens from London, UK, Vancouver, British Columbia, St Louis, Missouri and now Columbus Ohio. 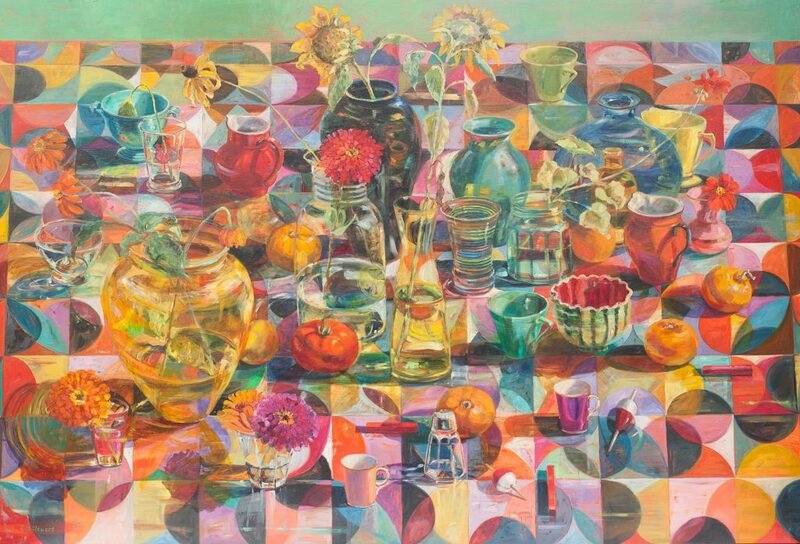 Â Carol’s still life and tablescape paintings are characterized by a sophisticated play of color and light. When closely studied, her pieces convey a network of patterning and mark making that creates texture and energy.Â Stewart is inspired by flowers, plant life, and objects ranging from glass vases to fruit.Â Whether the stage is set up in her studio or painted directly from nature, Stewart’s painting succeeds both at close range and from a distance. The viewer is invited into the scene: an explosive field of color. As one’s gaze is anchored on the piece, a unified composition emerges while, at the same time, specific elements stand out. 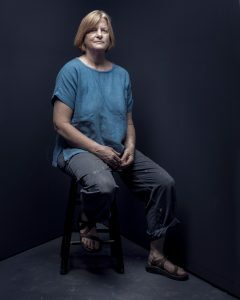 Subsequently, depth is established, objects are weighted through their shadows, and subtle balance is expressed through reflections of light that dance across the surface.Â “I am interested in the abstract elements of the art work as much as the subject matter.Â My still life paintings are not still.Â I feel that my paintings are lasting over time and invite repeated exploration.”Â Carol’s works can be found in private and corporate collections in Canada, the United States and Europe.